Hit the slopes with your fellow Mountaineers! For just $55 we will hook you up with a pair of skies or a snowboard for the day, drive you out to Canaan Valley Ski Resort, and provide you with a lift ticket. We'll be there from morning till evening, and head back to campus after sundown. Bring your own skis or board and the cost for ticket and transport is $45. Canaan Valley is a fantastic spot in West Virginia for all breeds of ski enthusiasts. With 47 different slopes, with runs ranging up to a mile long, the resort sports fantastic variance for difficulties of all types. 19% of the slopes are Beginner, so if you're new to the sport you can find your footing on trails such as Bunny Buster and Timber Trail. 36% of the trails are Intermediate-friendly, so once you find your comfort zone, challenge yourself on the likes of Buck Run and Ski Daddler. Lastly, 45% of the slopes are for advanced skiers. Test yourself on the Dark Side of the Moon, Prosperity, and Gravity. Get fitted with skis and poles and learn the basics of cross country skiing on some local trails! The cost is $30, which provides for your skis and transportation. Location varies depending on snowfall, full listing of potential sites here . SEVEN SPRINGS Weekday Ski Shuttle | Ski until 10 p.m. Cost: $36 - Includes transportation and lift ticket. Rental gear extra (See rates below). Did you know that the East Coast’s #1 Terrain Park is located within an hour and a half of Morgantown? With 7 different park areas that range from true beginner to some of the biggest features in the world, Seven Springs Mountain Resort has all the variety you need to have an epic evening. At 3:30pm on select Thursdays the Outdoor Recreation Center’s winter shuttle will transport you to and from the slopes with a lift ticket and gear if you choose to rent it. Only ten spots are available each week, so reserve your sport early to get a seat! Seven Springs has a wide variety of trails that are perfect for the beginner as well as an experienced skier/snowboarder. The Alley: Top to bottom bliss. Rails, boxes, jumps and hips snake their way down the North side of the mountain in quick succession. They Alley is a proving ground for riders looking to step things up. All along 3,500 feet of trail that has its own lift access! 15% of trails are expert in nature and with challenging terrain such as Goosebumps Slope and Avalanche Slope these trails are shore to get you adrenaline pump ing. Open until 10:00pm on Thursdays! With our shuttle leaving the Outdoor Recreation Center at 3:30pm you get a full five hours of skiing/riding in before it’s time to head back to Morgantown! 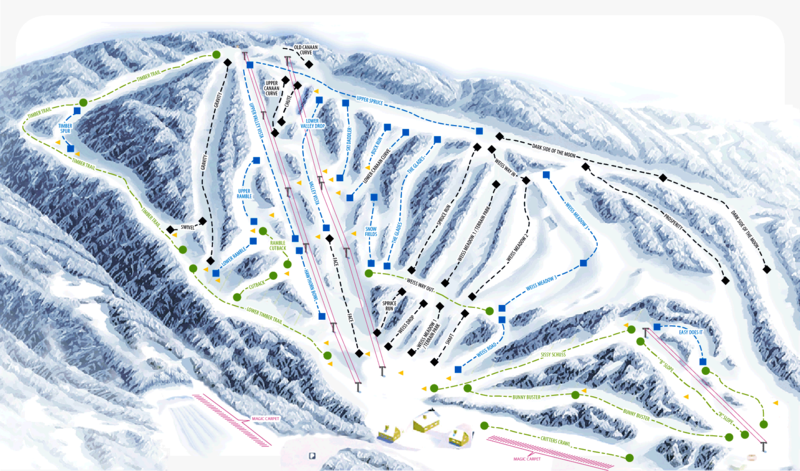 WISP Weekday Ski Shuttle | Ski until 9 p.m. Cost: $32 - Includes transportation and lift ticket. Rental gear extra (See rates below). Take a break from your busy week and hit the slopes! At 3:30 p.m. on select Tuesday and Wednesdays the shuttle drops you off at WISP with a lift ticket and gear if you choose to rent it. Only ten spots are available each week, so reserve your spot early to get a seat! Wisp has a variety of different trails perfect for newer skiers. The 3.8 mile loop sports bountiful diversity in difficulty. With 34 different runs there's bound to be a slope akin to your liking, some runs reaching up to 2 miles. 35% of trails are for beginners, so there's no shortage of activity for any timid newcomers. Get started on trails such as Backbone Pass and Possum. 38% of the trails are intermediate skiers, take your best shot on the likes of Road-Runner and Ace's Run. 27% of trails are for advanced skiers, so there's no shortage for those looking to test themselves on trails like the Northern Glades, Odin's Chute, and Eye-Opener. Reservations for skis can be made 1 day in advance. All rentals are done through credit or debit. No phone reservations.